Just like the heat here, strawberry season has been slow to begin. The baskets of fruit at the farmer’s market are still fairly expensive. But when faced with a divine smelling pint of beautiful, intensely red berries, I had to have them. They needed to shine in this dessert. No cooking or baking. Just raw, potent strawberry flavour. 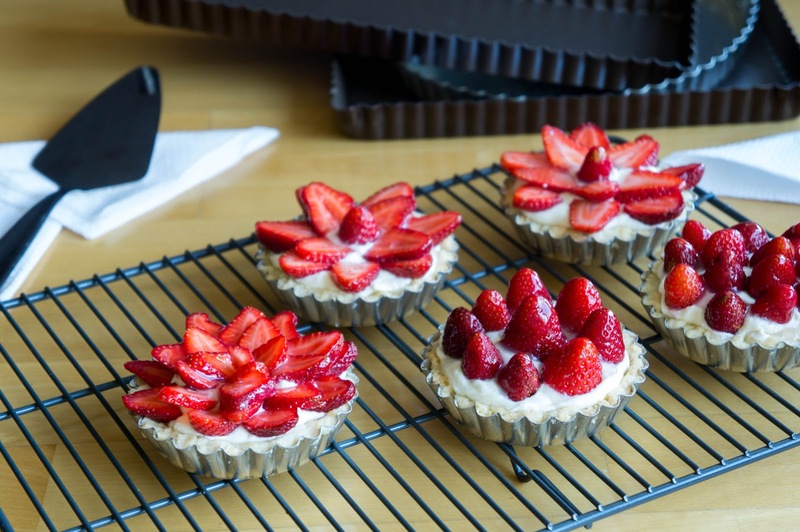 The filling of these tarts is a mascarpone and cream cheese concoction that works just as well as a cream cheese frosting substitute. 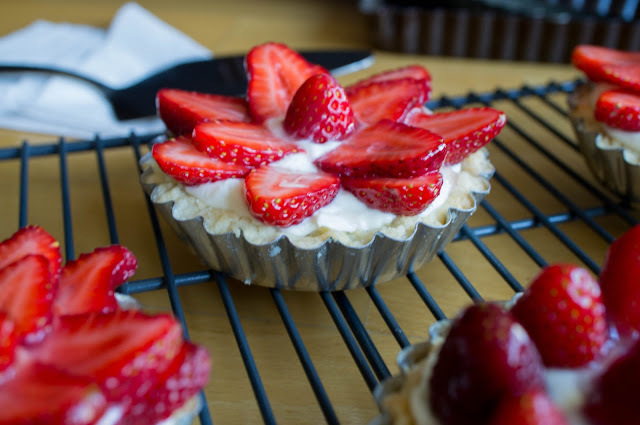 It sets delightfully fluffy when placed in these tarts and I’m imagining it as a no-bake cheesecake in the near future. 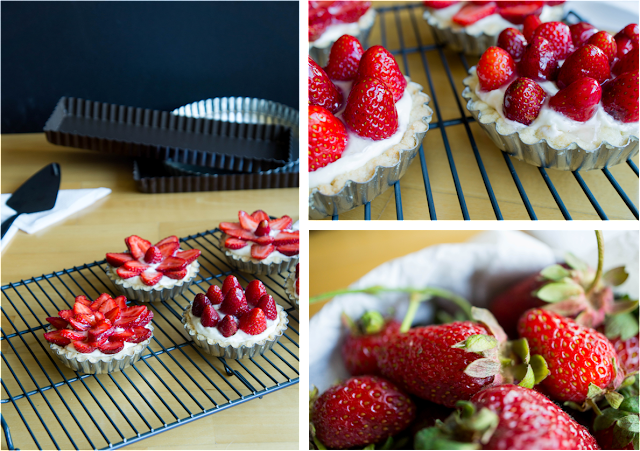 The tart shells are a simple short crust pastry and sturdy enough to eat the tart with your hands. Which is good because you will want to do so immediately. 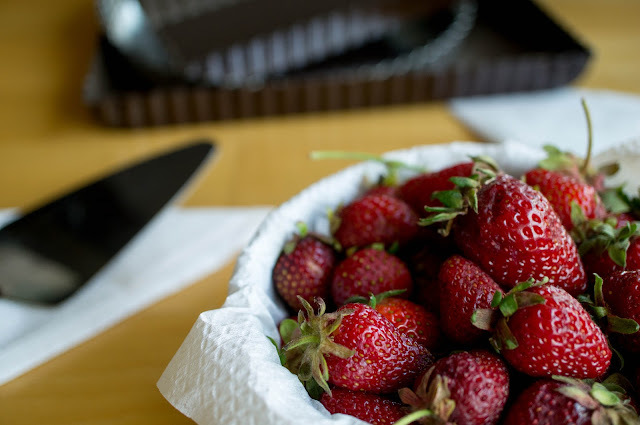 The strawberries stand proud over their creamy domain or fan out like red flowers over a fluffy white meadow. Beautifully sweet and vibrant with summer flavour. Combine flour, sugar, and salt in medium bowl. Add in cold butter, cut into small pieces. Using your fingers or a pastry cutter, combine butter with flour until the mixture resembles coarse crumbs. You don’t want the butter to melt. Add 1 tbsp of the milk and combine. You want the pastry to just stay together when pressed with your fingers. If it’s still too dry, add additional milk 1 tsp at a time until it does. It does not have to form a uniform dough, you’ll be pressing the moist crumbs into the tart molds, not rolling it out. Press the pastry crumbs into the bottom and sides of 5-6, 3-inch tart molds. Refrigerate for at least half an hour. This is important, if you don’t do this, the sides of the tart shells will melt back down to the bottom and you’ll end up with a pastry disc. Bake in the preheated oven for 12-14 minutes or until a light, golden brown. Let cool. Combine cream cheese and mascarpone cheese in a large bowl. Using a stand mixer or a hand mixer, beat until combined and smooth. Beat in vanilla. Add icing sugar and mix on low speed to combine. Add heavy cream and beat on medium speed until fluffy and thick enough to spread. Spoon the filling into prepared tart shells. Place strawberries on top of cream cheese filling. Either stand the berries up in concentric circles or slice the berries and arrange like a flower in overlapping layers. Or arrange the berries however you want, this is the fun part! Combine the water, lime juice, corn starch, and sugar in a small saucepan. Heat, stirring often, until the mixture becomes clear and thickens slightly. 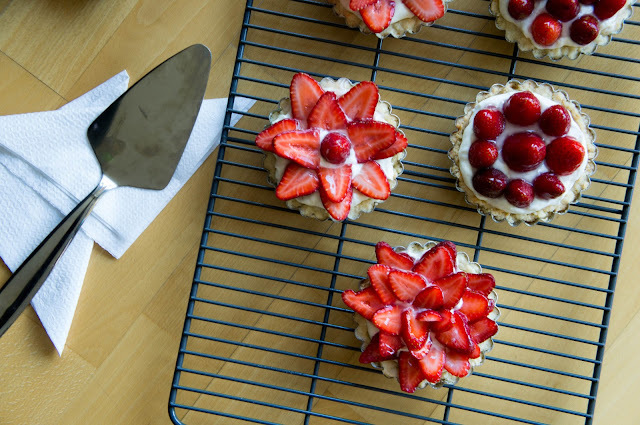 Brush the warm glaze over berries on the tarts to give them a nice shine and seal everything together.